In its latest Inside the Vault update, Bethesda finally outlined the new Fallout 76 PvP experience it's been hinting at for weeks. This new mode, Survival, will be a totally separate way to play the game, and while the full version is still a ways off, a beta is scheduled for March. Basically, when you boot up Fallout 76, you'll choose between Adventure mode and Survival mode, and then play the game according to the rules of your choice. Adventure mode players and Survival mode players will never interact, so you can think of the modes as being on two separate servers. Adventure mode is exactly what you've been playing, so nothing there will change. However, Survival mode removes a lot of the restrictions on PvP and actively encourages killing other players. You can play Survival mode with your current character or you can create a new one specifically for it. Bethesda advises that "all your progress from Adventure mode will travel with you, and anything that affects your character in one game mode will also affect them in the other," which includes, you know, bad stuff. And I expect a lot of bad stuff will happen in Survival mode seeing as how "all players, except your teammates or event groupmates, are automatically flagged as hostile toward one another by default." "You can attack other players without restriction from the first shot you line up, meaning every encounter you have with a stranger could turn deadly in the blink of an eye," Bethesda said. "Further, level scaling in Survival mode will work the same way it does in Adventure mode today. This will help to level the playing field a bit and give newer characters a fighting chance against high-level players they might encounter during their adventures in the Wasteland. As a result, you’ll need to keep your wits about you during every hostile encounter, because even low-level characters can pose a real threat." If you choose to enter this lawless frontier, you'll find killing other players more rewarding. 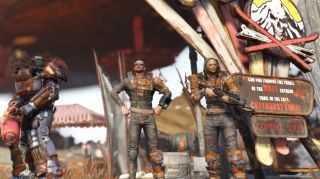 Bethesda says it's planning to award double Caps on successful kills, and you also have a chance of receiving "aid or other items in addition to their junk." Additionally, Survival mode won't have the 'seek revenge' option which lets you pursue your killer in Adventure mode. "However, it’s important to note that these changes aren’t set in stone," Bethesda said, "and we’ll be looking to make adjustments based on playtesting and your feedback during the Survival Beta." The beta's March start date isn't set in stone, either. Bethesda says it's still working on "leaderboards and other features and may need more development time for testing." In any case, Survival mode is on the way, so if you're among the group that wishes the Wasteland had more good old-fashioned gunfights, you'll get to run wild soon enough. As a reminder: no, Fallout 76 isn't going free-to-play.